The Champs-Elysées is one of the iconic Paris boulevards. 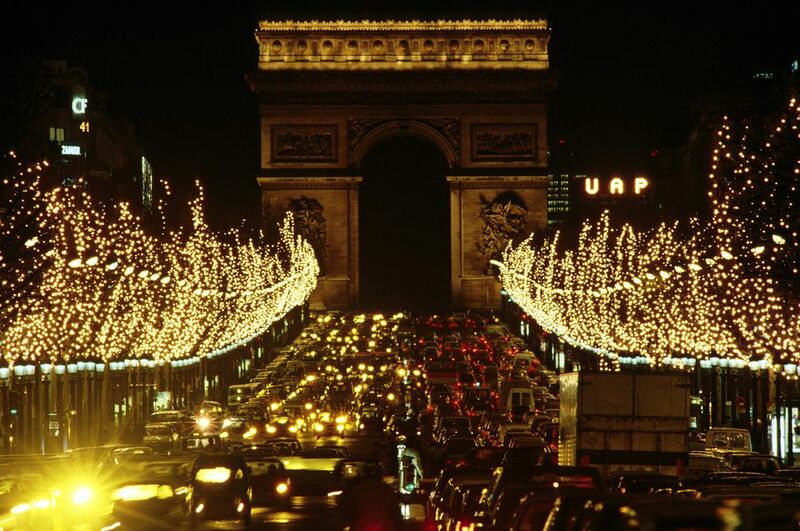 Who hasn’t dreamed about strolling glamorously along its tree-lined streets towards the towering Arc de Triomphe? While the famous thoroughfare is known for its belles promenades (beautiful thoroughfare/walks), it also has much to offer in terms of shopping, eating, and entertainment. In the neighborhood surrounding the famous street, you’ll find a brief respite from the intense crowds, a less touristy feel and a return to old Paris. The Champs-Elysées and its environs definitely merit a visit, especially on a first visit to the French capital. The Champs Elysées neighborhood is located on the right bank of the Seine, in the western 8th arrondissement of Paris, with the Avenue running through the area on a diagonal. The city of Paris is divided into twenty arrondissements municipaux, administrative districts, more simply referred to as arrondissements. The elegant Tuileries Gardens and adjoining Louvre Museum sit to the east, just past the vast Concorde plaza and Obelisque column. The military monument known as the Arc de Triomphe marks the western edge of the neighborhood. The Seine river lies to the south, with the St. Lazare train station and the bustling Madeleine business district situated to the north. The main Streets around the Champs Elysées are Avenue des Champs Elysées, Avenue George V, and Avenue Franklin D.
To access the area, the easiest option is to take Metro line 1 to any of the following stops: Champs-Elysées-Clemenceau, Franklin D. Roosevelt, George V or Charles-de-Gaulle Etoile. Alternatively, for a long stroll up the avenue from its beginning point, take line 12 to Concorde and walk from the bustling, dramatic square into the neighborhood from there. The formally planted trees lining the Avenue des Champs Elysées, which have become synonymous with the famed street, were first planted in 1724. Up until that date, the now-famous avenue was a smattering of fields and market gardens. The Champs Elysées has played host to numerous military parades over the years, such as the Free French March by the 2nd Armored Division on August 26, 1944, and the American 28th Infantry Division on August 29, 1944, both marking the Liberation of Paris from the Nazi Occupation during World War II. The largest military parade in Europe passes down the street each year on Bastille Day, marking France’s national holiday. While visitors flock to the Champs Elysées, they may only encounter one or two of the important sights. The must-see places in the neighborhood include the monuments and theaters. At the center of the Place de l’Etoile lies this most famous of arches, commissioned by Emperor Napoleon and inspired by ancient Roman arches. Impressive in scale, a trip to the top offers exceptional views of the wide, elegant Avenue des Champs Elysées. Rising up from the Champs Elysées are the splendid geometrical glass rooftops of the Grand and Petit Palais, built for the Universal Exposition of 1900. The Petit Palais houses a fine arts museum while the Grand Palais has a science museum and regularly hosts events and exhibitions, including the major international art fair known as the FIAC. This famous theater, located at 15 Avenue Montaigne, was built in 1913 in the Art Deco style, and instantly became notorious for its hosting of Igor Stravinsky's then-scandalous Rite of Spring. It's an opulent setting for an evening out in Paris. Lido is one of the city's famed cabarets, offering a borderline kitschy but always entertaining revue that rivals the Moulin Rouge. There are eateries ranging from neighborhood bistros to fine dining restaurants. We've chosen a few of the more popular haunts. After hours of strolling and window shopping along the grand avenue, sink into one of Fouquet’s leather armchairs and treat yourself to a coffee or cocktail—it's perhaps the only thing you’ll be able to afford here. Portions are small and prices are steep, but Fouquet’s is frequented by the likes of post-César film award party-goers and the French president. The famous brasserie has even been named a Historical Monument of France. Enter this relaxed, ranch-like eatery and you’ll almost forget you’re in one of the chicest areas of Paris. The theme here is beef and you should only come here if you’re willing to make a meal out of it. All the meat is organic and hails from cows raised in the Midi-Pyrénées region. Pair your steak with one of their 800 wine selections from southwest France. If you’re starting to get tired of French cuisine, head for this swanky Lebanese restaurant just off the Avenue des Champs Elysées. Here, you’ll find rare Middle Eastern dishes such as minced lamb, onion, and cracked wheat croquettes, plus delicious vegetarian classics like hummus and tabbouleh. Unlike most restaurants in Paris, Al Ajami serves food until midnight. Looking for some of the best macaroons in the city? Stop into Ladurée and you might just find Utopia. Aside from macaroons—which come in delicious flavors such as pistachio, lemon, and coffee, sold in the trademark light-green boxes, Ladurée offers some of the most scrumptious pastries and sugary delights available in the city. One of Paris' major shopping districts, the Champs-Elysées neighborhood is host to both global chains and exclusive couture designers. There's little in the mid-range here, however. Off of the grand Avenue, many more shopping hotspots await. The ultra-chic Avenue Montaigne boasts boutiques for couture designers Chanel, Christian Dior, Emmanuel Ungaro, Versace, and others. The equally prestigious Rue Saint-Honoré isn't far, either, offering a collection of boutiques. The exclusive Champs-Elysees, called the "Champs" is probably not where you're going to find nightlife where the locals hang out. Its famed club scene often attracts tourists who haven't made it past the Eiffel Tower and straight-out-of-school suburbanites in search of the big city experience. Dedicated clubbers will find some good choices for dancing and all-night partying in the area, though. If you want to go to the smaller clubs, dress Parisian-chic to get past the doormen—and expect some sobering cover charges. Le Queen (102 avenue des Champs-Elysees): A gay club, and one of the better spots for a dance. Le Baron (6, avenue Marceau): This small and exclusive lounge, with a capacity for 150 people, serves as the "it" place for the international jet set crowd. Situated in what was formerly an unmarked brothel, it has the decor to prove it. Befriending a regular still serves as the best way to get in.